NRA Basic Pistol Class Saturday February 16, 2019 at 9AM - Hendershot’s Sporting Goods, Inc. Learn in detail how to safely and responsibly handle and shoot a handgun. This class is a prerequisite to the NRA Pistol Instructor Class. This is an NRA approved training class. 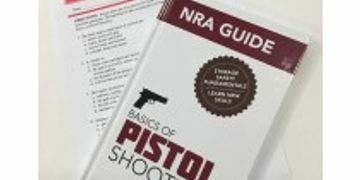 The class will follow the National Rifle Association lesson plan. The class will be instructor led. Tuition includes all class materials including reference books, eye and ear protection, rental handgun, ammunition, targets and more. Certificates are issued to those who successfully complete the training. Shooting will be held on Hendershot’s state of the art indoor range that is climate controlled at a constant 72°. The class will be held on the second floor classroom at Hendershot’s Sporting Goods. Food and non-alcoholic drinks are allowed. Class size is limited sign up today!